Went wreath shopping with the family today – the Parkdale market is very much within walking distance of where I live – and they have scores of cut trees and branches all smelling pine-ey and Christmasey. The light in the sky today was beautiful, so I wanted to capture SOMETHING with my G11 while walking around, even though I was carrying my youngest son at the same time. 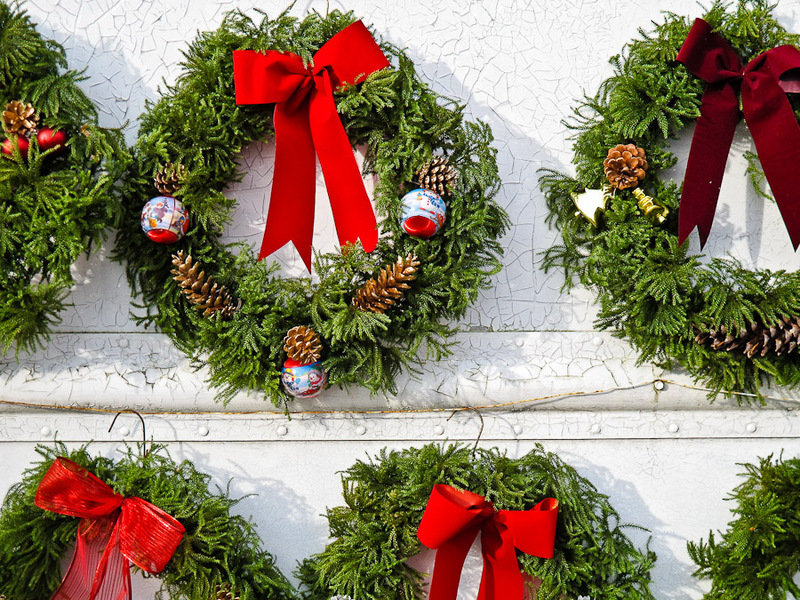 The old cracked paint of the trailer these wreaths were hanging from gave the image more texture than you’d see in any Wal-Mart or Costco display – and if you were there you’d smell the smoke from the wood stove inside, keeping the salesfolk warm in-between customers. Posted on Monday, November 29th, 2010 at 4:39 pm. Filed under: Uncategorized	RSS 2.0 feed.